Dorner’s new AquaGard 7100 Series Stainless Steel Flexible Chain Conveyor can twist and turn into the tightest of spaces. The flexibility is ideal for product routing in wipe down sanitary applications in the food, packaging and pharmaceutical industries. As the footprint around machinery, production areas, and plants continue to shrink, the AquaGard 7100 Series Stainless Steel Flexible Chain Conveyor is the ideal platform to maximize available space. 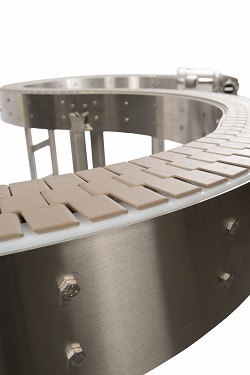 The conveyor is engineered to make tight turns, and be configured for inclines and declines to provide the ultimate in flexibility for customers. The innovative design includes powered micro pitch transfer modules and side transfer modules for maximum performance. The sleek frame design includes the latest technology and components for unmatched performance and durability. And with the sanitary attributes of the AquaGard platform – the 7100 Series delivers a great solution. The AquaGard family of sanitary conveyors is a stainless steel line that offers maximum flexibility for a wide variety of products and applications while increasing throughput and reducing product loss. The AquaGard 7100 Series Stainless Steel Flexible Chain Conveyor is built to exact customer specifications. Contact us today for more information on the new AquaGard 7100 Series Stainless Steel Flexible Chain Conveyor.